As you can see, about 2/5 of respondents are performing some form of analysis-based fragmentation removal (answers 5+6), which I consider the best way to perform index maintenance, if you’re willing to invest the time involved to set it up. It allows the least amount of work to be performed, for the most targeted performance gains – and so is especially appropriate for 24×7 systems where there’s a minimal or non-existent maintenance window. The next best option is to do all rebuilds or all defrags based on a fragmentation threshold (answers 3+4), which about 1/5 of respondents do. This also allows work to be limited, but by choosing only a single method of removing fragmentation, there are pros and cons. Now, the survey was limited to a number of questions so I couldn’t explore what the threshold is that people are using (e.g. logical fragmentation, page density, extent fragmentation, or something else). Some measures are good to use and some not so good, and I’ll be exploring the various counters and ways of determining fragmentation as the series progresses. Either of the options to operate on all indexes regardless of fragmentation (options 1+2) can lead to lots of wasted resources (disk space, transaction log space, I/Os, CPU) by operating on indexes that are not fragmented in the first place, or for which fragmentation removal has no benefit for workload performance. About 1/3 of respondents do this. 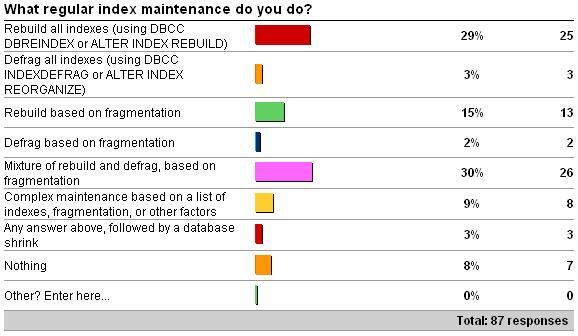 This isn’t surprising to me as rebuild-all-the-indexes-every-night/week is a very common index maintenance plan for “involuntary DBAs” who know that index maintenance is important, but don’t have the knowledge or training to implement a more sophisticated maintenance plan. This growing size of this group of people is one of the main reasons I’m going to write this series. Doing absolutely nothing for index maintenance, which about 1/10 do, is usually not a good idea, as indexes in a database that’s not read-only commonly become fragmented over time. However, these people may know they don’t suffer from fragmentation issues, or that removing fragmentation has no effect on workload performance. However, my suspicion (based on what I see in the field) is that some of these respondents don’t realize the benefits of performing index maintenance. You may be surprised to hear that I don’t consider doing nothing to be the worst choice. That dubious honor goes to answer 7 – doing any kind of index maintenance followed by a database shrink operation – as 3 respondents do. A post-maintenance shrink operation may well undo some of the benefits of the maintenance by introducing massive amounts of index fragmentation – see my blog post Auto-shrink – turn it OFF! for details of how bad this can get. I’m actually pretty encouraged by these results though. Compared to how things were around 1999 when I wrote DBCC INDEXDEFRAG and DBCC SHOWCONTIG for SQL Server 2000, these results show that knowledge in the field (or at least in the group that reads my blog and responded) has vastly improved. My aim for the forthcoming series about index fragmentation and maintenance is to increase knowledge a lot more broadly. Next up – this week’s survey. Thanks for reading!